The collections at Fire & Ice are as varied as what is found in open air markets around the world. Jewelry, art glass, fossils, crystal formations and carvings are well represented at Fire & Ice. Center City District Sips returns on June 3! Every Wednesday this summer, Center City bars and restaurants will offer $5 cocktails, $4 wine, $3 beer and half-priced appetizers. The happiest hours around will be 5-7pm on Wednesdays. For participants and specials, visit CCDSips.com. Tuesdays at dusk, catch Hollywood blockbusters at Pictures in the Park. Wednesdays, there's a Farmers Market, 11am-2pm, and XPN welcomes Live @ Lunch presented by PNC brings the best in local music, 12-1:30pm. On Thursdays, get down and unwind with DJs & Drinks at Dilworth Park presented by The Graham Building, 5-7pm. It all happens on the west side of City Hall. Schedule and programs subject to change. Visit DilworthPark.org for complete schedules and details. Fergie’s Pub is bringing back its popular "beach" beer garden. The pop-up is conveniently located in the parking lot next to the pub. Guests can look forward to beer like Lagunitas Dogtown Pale Ale, Sierra Nevada Summerfest, Firestone Walker Pivo Pils and Great Lakes Burning River Pale, along with refreshing spiked smoothies. On the food side, a beach-inspired menu of plates like shrimp kebabs, veggie dogs, hot dogs, chicken tenders, seitan tacos and fried pickles will be available. Games like Jenga and foosball will round out the fun. Open Wednesdays through Sundays through July 15 (Construction on the lot is slated to start then). The Free Library’s summer reading program is entitled "The Summer of Wonder," inspired by the 150th anniversary of Lewis Carroll's classic novel, Alice's Adventures in Wonderland. "The Summer of Wonder" takes place from June 15-August 7, and features programming that focuses on a different topic of brain-bending wonder each week, from magnet mazes and Mad Hatter card games to chess games and cryptology brain teasers. The program is set to kick off with an event featuring award-winning children's book illustrator Zachariah OHora (who created this year's summer reading program art), the Phillie Phanatic and more, on June 8 at 10am at the Parkway Central Library, 1900 Vine Street. For information, visit FreeLibrary.org/summerreading or call 215.567.4341. Grab a team and your favorite beer or wine to play Quizzo with Johnny Goodtimes and Drink Philly! on June 9, at 5:30pm. The event is free and open to the public. Winning teams get $100 gift cards to spend in the Market & Shops at Comcast Center! Let the games begin. ODUNDE, Inc. is a world-renowned cultural organization with the mission to serve the need for cultural enrichment in the African American community. They’re kicking off their 40th anniversary festivities with a series of events. These events will be held at locations throughout the city, including the African American Museum of Philadelphia (701 Arch Street). This will culminate with their annual street festival. Covering 12 city blocks, there will be more than 100 arts & crafts and food vendors and two stages for live entertainment. The ODUNDE Festival is the largest African American street festival in the country. Brides-to-be: Nicole Miller Philadelphia at the Bellevue is hosting an exclusive bridal trunk show, June 11-14. Enjoy 10% off all bridal purchases during the event. Expert bridal stylists will also be on hand to offer advice and guidance to help you find the perfect dress for your wedding day, and "Say Yes" as a Nicole Miller Bride! By Appointment only, RSVP: fsoto@nicolemillerphiladelphia.com. This year’s Philly Pride Parade and Festival Weekend theme celebrates "Reminder Day," the 50th anniversary of the 1965 Independence Hall gay rights picket. Start the weekend festivities with the Pride Kick-off Party on June 12, 6-10pm at 12th and Locust Streets. On June 14, also known as PrideDay, the annual parade starts at 11:30am at 13th and Locust Streets. 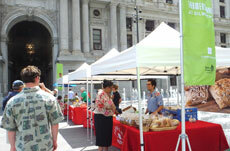 It proceeds through Center City to its judging stand at Independence Mall, 6th & Market Streets. Ultimately, the parade leads to an all-day festival at the Great Plaza of Penn’s Landing. Fran Drescher, Alex Newell and many other entertainers will be there.